Explaining about chaji and all the details of the procedure will require a lot of pages. This first page should be your starting point while reading about chaji. You should be able to find most of the information directly linked to chaji from this page (when I’m done remodelling it). Chaji is a tea gathering during which the host serves food and sake in addition to Koicha and Usucha. A chaji takes several hours to complete. This page and the ones found in CategoryChaji detail the entire procedure. The explanation on this page will only deal with Furo Shogo Chaji, for the other types please refer to the section below about types of chaji. Shogo is the "standard" form of chaji and it is therefore reasonable to use it as the basis for this discussion. The guests arrive at the tea house and enter Machiai, where they are served hot water. Then they enter the garden and wait until the host comes and greets them. This is part of the Shoiri. Then the guests enter the tea room (First Seki where they are served food called Kaiseki. Then the host does Shozumi. Those two things takes between 1 and 2 hours. When this is done the guests go back out into the garden for Nakadachi. After about 15 minutes the guests come back into the tea room for the Second Seki. During this the host will serve Koicha and Usucha. In between these two tea servings teishu will replenish the charcoal in Gozumi temae. There are seven standard types of chaji: Shogo, Yobanashi, Asacha, Hango, Rinji, Atomi and Akatsuki. The links below show a chaji in chronological order, look at each of them for a more detailed explanation of chaji procedure. Haiken of tokonoma where flowers have been placed, and then temaeza with chaire and kama. When the guests have left the tea-room the teishu goes to the nijiriguchi and does a last bow. Rinji　臨時 a.k.a. Buji 不時- spontaneous, not one of the three “timed” chaji. “Buji” can also mean simply a chaji held outside usual times; Tsuzukiusu optional; something special used. Atomi　跡見　- Guest invite self(ves) to view previous chaji (Dogu or Shomo); mid-morn or mid-afternoon; only very close friends may invite themselves; never invite someone to Atomi; Tsuzukiusu optional. Yuzari　夕去： furo evening; bring in lights, katori senko; can reverse scroll and flowers; Tsuzukiusu required. zanka no kai　残火の会： buried charcoal- omisoka 大晦日　(New Year’s eve); ro; usually lit charcoals (with extras) buried in ash overnight and excavated in morning to re-kindle first kettle of New Year. Sign of continuity. tsuizen　追善- funeral, memorial；morning, afternoon (never late, evening); white and yellow, or black; Budhist, Christian symbols depending on immortalized one’s beliefs; rosary, sacred jewel, hossu (fly whisk), nyoibo (sacred mushroom/cloud scepter), something beloved of the Memorialized one; photo or portrait. Kimono / Haori or coat, Tabi change in tabi’ire, Hakama / Jutoku, etc. Make arrangements to travel to Teishu’s seki. DO NOT BE LATE： it is much better to be too early and walk around the neighborhood than to be late. Being late throws off all timimgs of rice, Sumi, waterings, etc. and throws the Teishu into a panic. Guests should not come together, unless they do not know where the seki is. In Emergency situations on the day, if possible, the Guest should go to the machiai and then apologize for not being able to stay. If the emergency is known in advance, a telephone call to both Teishu and Shokyaku will have to do. Do not try to find a replacement. Besides the physical requirements, the Guests must be ready to play their part as participant / observers. The best way to appreciate the Host’s efforts is to pay attention to every detail. Of course, a general knowledge of Chinese as well as Japanese poetry, history, artists’ and other names from history, theater like Noh and Kabuki, as well as Shinto, Buddhist and even Christian beliefs are basic for enjoying the interplay of references and associations that the Host will call upon to create his/her toriawase. Contacts other Guests, who may also write replies. This is the time and place to warn the Teishu if you ( or any of the Guests) have any allergies or if you do not drink sake. It is very distressing for the Teishu to come unprepared to a Guest who refuses sake, without having thought of something alternative to serve. Duties of Teishu and Hanto sometimes overlap. The most important thing is that all the preparations are done on time, so the Guests can enjoy the chaji. There are some things the Teishu SHOULD do (shitabi, hana) but if Teishu is suddenly indisposed, the Hanto is expected to be able to do everything, like an understudy, in effect becoming Teishu. Indeed, both the Teishu should be able to do the whole chaji, (minus the food, usually) BY THEMSELVES, ALONE. In the mizuya, there will be opportunities for Teishu to do some things that might be considered the Hanto’s “job”. But ideally the Teishu should be able to do everything and keep the chaji on time. Working together strengthens team spirit and helps the chaji go smoothly. Usucha – sifting, filling Usuki; Usucha bowl. 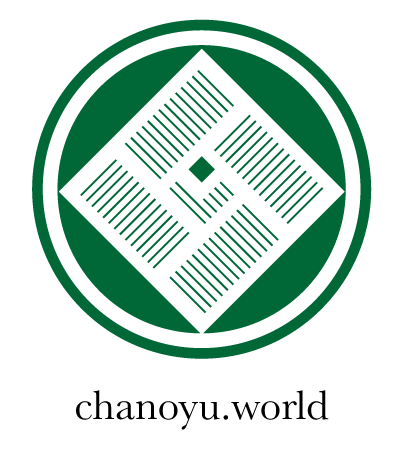 do Temae / Haiken： (tana/Hakobi) Shozumi, koicha, Gozumi, Usucha. replenish Hibachi before Guests return home. at the end- opens everything (from Machiai on) for Guests to find their way out. The first and often most direct impression of a tea gathering is the fragrance which greets the Guests. The express purpose of this use of incense is to “wait for” the Guests in place of the Teishu and to allow the Guests to calm their minds before entering the deeper tea spaces. After cleaning the rooms before the Guests arrive, the incense purifies the space spiritually and helps separate it from secular space. Upon entering the waiting room, machiai, of a tea complex, the Guests are treated to the rich fragrance of Jinko. Shikimono are things spread out on the Tatami floor of the machiai to： 1. give comfort to the Guests and to indicate where they, especially the Shokyaku, is supposed to sit. They are warm in winter and should be cooling in summer. Mousen 毛氈　- felted wool carpets, dyed red, blue, colors; Mousen, as the name implies are originally from Mongolia brought thru China, and imported by the tens of thousands in the Edo period. Neither wool nor felt was native to Japan. Earliest examples of felted wool came thru the Silk Road to Nara (7th century; Shoso’in collection) but felt of any kind was not made in Japan until Meiji. Carpet, etc. Imagination is your only limit, as long as the shikimono does not get Kimono dirty, stain with unfast color, snag on projections or feel more uncomfortable than Tatami. Next in importance to the waiting room’s scroll but perhaps even more important than it in terms of hospitality, is the tabako bon, a tray for the various implements used in smoking Kizami, the traditional shredded tobacco. wa rosoku 和蝋燭 – sumac wax with paper + toshin ( pith wick). Toro 灯籠 – Namporoku- #15- ” For night gatherings when snow has fallen, you should generally not light the stone lanterns (toro) in the Roji. Overwhelmed by the brightness of the snow, they afford nothing worth noticing, their light wan. There may be exceptions, however, depending upon the conditions or the presence of trees; it is impossible to speak absolutely.